With six beaches less than ten minutes away, you may want to pick and choose which ones you visit. Each is unique and offers different activities, plus some are just plain better than others. Get the insider’s view for each one, starting with the closest: Casey Key. And don’t forget to read our quick guide to finding shark’s teeth. 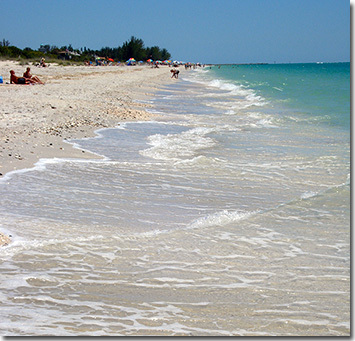 Starting right at the Motel, you can visit Nokomis Beach just out your door, or walk South on Casey Key Rd. about 100 yards to the public Nokomis Beach. This one has the obvious perk of a great location. The sand and water here are impeccable and generally very low on seaweed. You will find a lot of sharks teeth here, either washed up on shore with the seashells, or by sifting in the sand just a few feet into the water. Head South on Casey Key Rd. a couple miles and you will dead-end at the North Jetty. First, you will hit a large parking lot on your right which leads to the beach, pavilions with grills and playground area. Or continue a couple feet to the North Jetty parking lot. 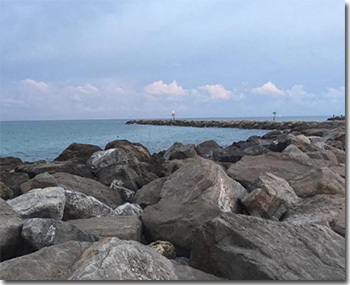 The Jetty is a great fishing spot, plus they recently added public restrooms accessible from either parking lot. There is concession at the North Jetty Tap and Grill - Typical concession stand food. Often on the weekends they have live music. You will find a mostly younger crowd here. Again, a lot of sharks teeth available if you look for them. You can see the South Jetty from the North Jetty. 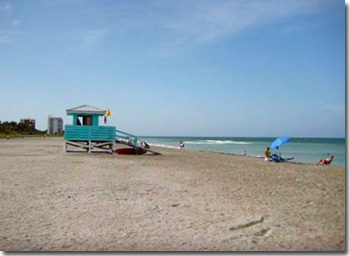 However, to get here you have to travel out to Tamiami Trail and South to Venice Island. Just before you hit the parking lot you will find the Crow’s Nest restaurant. They are a huge two-story restaurant offering great views of the water, and outdoor seating upstairs. Food is good but a bit pricey. The South Jetty is great for fishing, but there isn’t much for a beach. This beach is at the end of Venice Ave. It has two parking lots you will see on the right and left when you reach the end of Venice Ave. In between the parking lots is a shaded area with seating, concessions and occasional live music. Recently the city dredged along the beach, so it stays shallow quite a ways out. The water is bright blue, too with very little seaweed. 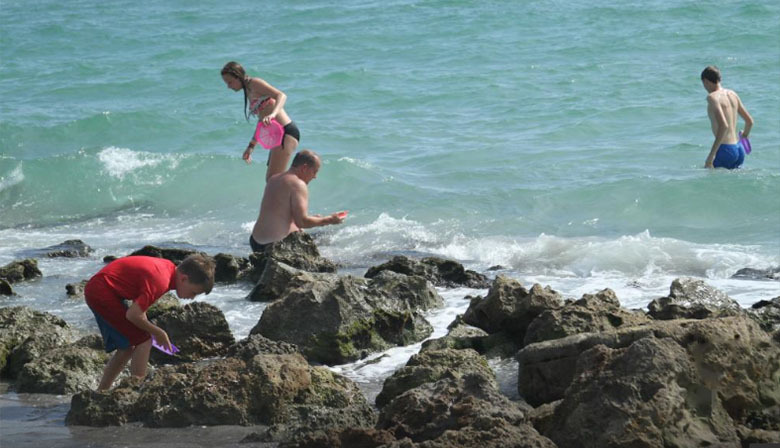 You can find shark’s teeth here as well, but there are more on Casey Key. Travelling down Tamiami Trail on Venice Island (also called Business 41) you can turn right on San Marco Dr. When this dead-ends on Harbor Dr. turn left and travel about ½ mile. You will see Sharky’s on the Pier restaurant on your right along with a lot of parking for the beach right next to the restaurant. 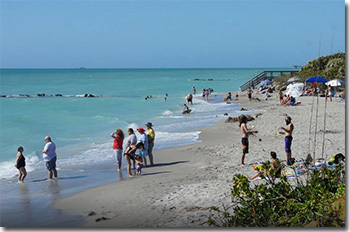 Additional parking was recently added, and the beach had new sand dredged in early 2015. This beach is known for its shark’s teeth. Public restrooms and several rinsing stations are available. 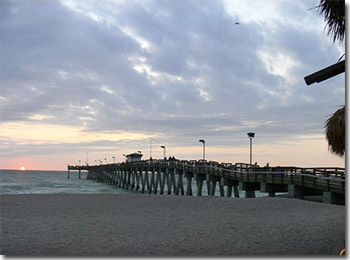 If you park at the restaurant, you can walk the pier for a great view, or stop and eat. The dining is reasonable on price, and it’s very touristy. If you continue heading South on Harbor Dr. instead of stopping at Sharky’s, you will dead-end on this beach. The sand isn’t quite as nice, and there are more large rocks in the water. It’s generally a quieter beach with less people. They recently installed public restrooms here, and there is a playground with a pavilion in the parking lot farthest South. Shark's Teeth are an especially popular activty for vacationers and residents. They are simple to find for kids and adults, and you easily can go home with several each day. Wal Mart, or Casey Key Beach Shop (just a couple blocks away on Albee Rd.) will have what you’re looking for. Basically any sifter will do, but the plastic hand-held ones are better for kids. 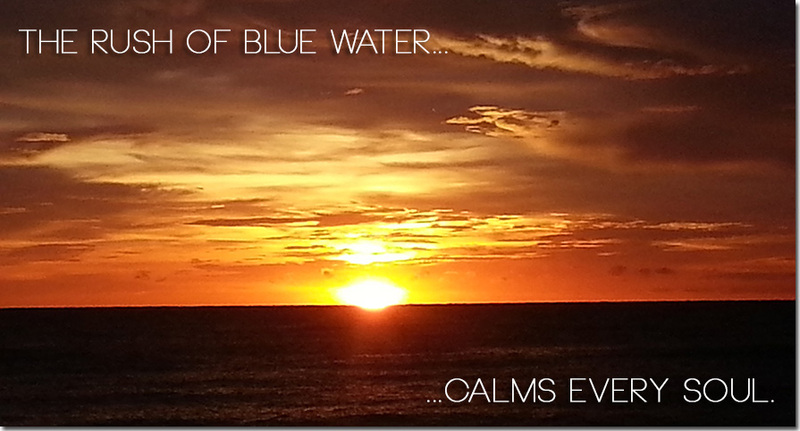 Look for something that isn’t going to bend or break with some wet sand in it. Sharks teeth are black in color and come in many sizes. Most are about the size of your thumbnail. Sometimes they will be chipped. There are two places you can look: On shore along the seashell line, or in the water in the middle of the drop-off. Some sharks teeth will be sitting among the seashells where the water left them at high tide. You won't find as many here. In addition, just a foot or two into the water, the sand "drops off" or suddenly descends a couple feet down. In the middle of the drop-off, use your sifter to grab a pile of sand. Then sift off the sand along the waterline to see your shells and sharks teeth.